I think I read this book all wrong. I think I was reading too much into it or, as the case probably is, not into it enough. I’ll start with the things I didn’t like because I’m the kind of girl who likes to get the bad news first so it’s out of the way and I can be consoled and wrap myself in the fuzzy warmth of the good news. Firstly, I was expecting this to be a more… definite. Don’t get me wrong: It is about the war and it was really interesting the read about the persecution of Romani gypsies at the hands of the Nazis in Eastern Europe. I can’t think of any other books that I’ve read, and certainly not young adult ones, that focus on this subject. But it was about the war in extremely abstract terms. Soldiers, tanks, bombs and weapons are all mentioned but almost in passing and in conversation between the animals. Yes. The talking animals. So, I’m not sure whether that was just me and my expectations but yeah… so that was my main problem. I wonder how I would have felt about reading this if I hadn’t read so many books about WW2 in succession? Oh well, we’ll never know. It was also extremely short and I would have loved to have spent more time on Andrej and Tomas’ journey as opposed to the head-scratching conversations with the animals. Anyway, now to the good parts. Wow, Ms Hartnett can write. Holy guacamole! There was a point, as my hand started to get cramp, whether I seriously considered just forgetting writing down my favourite passages and just photocopying it to stick in my notebook. It read like a fairy tale… like a true fairy tale. Dark, frightening, thought-provoking and with wisps of magic snaking through the prose. This is how writing should be all the time. THERE IS NO EXCUSE, AUTHORS. I also loved the relationship between Andrej and Tomas. I love stories that focus on siblings (I have two and they’re both a huge part of my life!) rather than a romantic element because I always think that romance is easy (or at least it’s easier) to write. Relationships between siblings are much more complex, there’s always love but there isn’t always like. Ms Hartnett created such a pure and wonderful relationship between these boys (and let’s not forget Wilma!). They were so gorgeous. 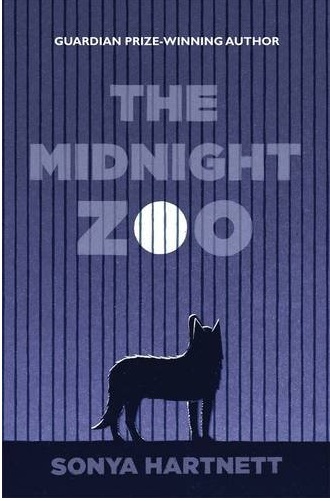 My favourite was the one where the boys first see the wolf standing in his enclosure in the moonlight. They were extremely striking, simple but effective. So even though this book was a little disappointing, I still liked it and I have on good authority (From the lovely Nomes at Inkcrush!) that her other books are fantastic and I hope to get around to reading them soon.